Winter has come early this year, with several paralyzing ice and snow storms well before Christmas; yet it's moderated considerably and perhaps we've a short reprieve. With three Virginia sections left for the winter months, it seems a good time to knock off the first of these, as Coleen's planned surgery in January will certainly keep us off the trail for a while. Even now, she's very anxious about how her weakened knees will hold up. Little do we know the twist of fate that awaits us. And the soul, afraid of dying, that never learns to live"
With a mere 4 days available to hike, we've selected a short 55 miles in mid-Virginia, stretching from Rockfish Gap at the southern end of Shenandoah National Park southward to the sleepy town of Buena Vista. We're shuttling ourselves this trip, dropping off one car at a picnic area (at the AT road crossing) outside Buena Vista, and taking the other up to Rockfish Gap to begin our hike. As we check in at the Rockfish Gap info center one of the clerks here suggests a walk up VA 610 instead of the trail, which he describes as �having the same views, but without the ice�. We don�t quite take the hint (especially since the concept of us hiking the AT seemed totally foreign to him), but after loading up and heading to the Blue Ridge Parkway gate, we�re a bit surprised to find the Parkway closed, a huge ice heap around the gate. There�s no evidence of blazing beyond this or up 610, but finally after a considerable search, Coleen finds a woodlands path below the parkway, and we�re off. It�s easy path, with occasional snow on the northern exposures, but nothing tough, and we�re both feeling good, making good time as we wind around to the south. 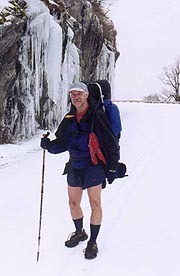 We�ve begun with jackets on, but in the few ups and downs it appears obvious they�ll be too warm for the serious uphill ahead, so we stop at the Paul Moore shelter for a quick wardrobe change. 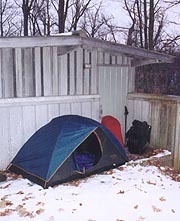 It�s a clean, immense shelter, at the bottom of a hollow by a clear-running stream, but ahead lies a steep hill which the profile shows will continue most of our afternoon � looks like an hour up the shallow slope, a bit of level, then an hour up the steeper slope, with a short downhill to our destination. It appears we'll be in by 5:30 or so, and we push ahead, the snow gradually increasing as we climb up the north face of Dobie Mt. We pass a trio out for a short hike, the father of the group giving a brief description of the picnic area at Dripping Rocks, where we plan to spend the night. It sounds like all I�d anticipated, and we drive ahead on this beautiful clear day, taking occasional pix of Coleen hiking through the snow, which continues to increase as we climb. Soon it covers the trail, and although there�s an old set of bootprints here from before the ice covered the snow, they�re too slick and of little help on the steeper grades. I find I can kick steps into the ice-encrusted snow, which allows Coleen to keep up a little better, but it�s an incredible amount of work for me. Passing a side trail to Humpback parking, I'm confused, as we�re quite early for this by the map, but we drive on, joining a road for what appears the short level segment. Darkness falls, slowing our progress; and soon there's a total lack of blazes, but the trail and bootprints continue up at a gentle grade � far gentler than the profile shows. It's now I find my compass was left behind, and being off-trail and at night, I�m a little worried. Nothing matches, and being off the AT, I have no way to determine our position or even the direction (the sky having clouded over). 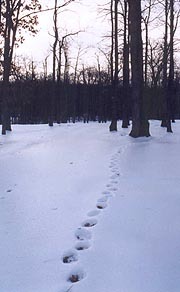 Searching the map, I see a possible side trail we might be on, so we decide to continue ahead, following the bootprints wherever they lead. 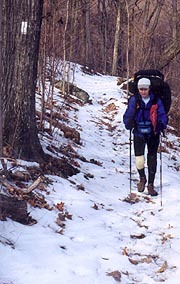 By now the snow cover (and darkness) is total, and the ice getting thicker atop it, becoming difficult to even kick steps; so it�s quite arelief when we finally come to a blue-blaze trail, which minutes later intersects the AT. We�re been victims to a massive relo (later we�ll confirm this, adding a full 2 miles to the trail), and assuming the newer Data Book mileages to be correct, it�ll be a couple hours yet before we get to our planned camp. 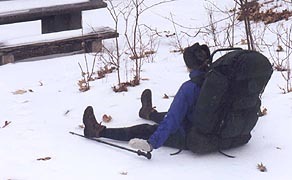 Even worse, Coleen�s suffering badly from knee pain now, and the snow / ice cover continues to worsen, giving me serious doubts as to whether we�ll even make it to the picnic area. Finally we top a rocky ridge (we�ll later find this to be The Rocks, although we suppose it now to be Humpback Mt), getting a beautiful panoramic view of the night lights in the valleys around, but we've miles to go. We have to search in the dark for the direction the trail leaves here, and after a brief saddle it resumes its climb again, pushing on to the real Humpback Mt. Our progress is glacial as we continue our climb, but finally we reach the summit, with a commanding view, but with Coleen still hoping to camp on dry ground, we push on. On leaving here, Coleen thinks we�re heading the wrong direction, but by showing her the small loop on the map around Humpback Mt, and the absence of virgin footprints in the direction we�re going, I convince her otherwise (barely convinced myself). On the next mountain over we see the Wintergreen ski area (having heard the roar of the snow-making equipment for some time), confirming our direction, though it still looks a long way off. I ask Coleen in one saddle if she�s ready to stop and find a camping spot in the snow, but she wants dry ground, and soon we reach The Cliffs, with a panoramic view of the Wintergreen complex, all the slopes lit up for grooming (no skiers though). There�d make for beautiful photos in the daylight, but that�s not an option, so we continue down the cliffs, having to search a bit to find a descent we can negotiate. Finally it's the final lap to the picnic area, though it�s a continuous downhill, very treacherous in the ice. It�s painfully slow, but finally we come to a blue-blazed trail which can only be the promised land, a short :15 walk leading to the first of the stone picnic tables. They�re all covered with snow and ice, a narrow area of dry ground underneath; so we continue around the road, with me barely spotting a hulking shape to our right that doesn�t look natural. It turns out to be the restrooms, locked of course, but with a narrow overhang over a sidewalk on each side. The south side is clear of snow, but the wind�s blowing from this side, so we choose the north side, scraping off a patch of snow and ice to make room for the tent. With a nearby pile of leaves scooped up to cushion it all, we're set up and donning warm clothes for the night, retiring into the tent for our dinner sandwiches. We follow it up with the customary hot drinks, and by the time we�ve got the food bag hung and all in readiness, we retire at 11:00 to the sounds of a light freezing rain. "Not even the angels stand higher than the man who took the wrong way and then returned." We sleep until an astounding 7:30, Coleen now positive she wants to abort, taking the Blue Ridge Parkway to the car. The sun shines briefly, and it seems the only penalty from last night�s storm is a thin coating of ice on the front of the rain fly, so we�ve gotten off easy, with a fairly warm morning out. After a quick breakfast we start looking for the easiest way down - Coleen insists on going down to the road from which we entered, immediately falling on her bewtocks. The ice is even slicker than last night, and I suggest she slide down to the road in her present position, as I head up to the higher road above us. There's a 2nd building here, with a porch on each end - it would have been slightly better, but we�d never have seen it in the dark. The access roads in the picnic area are gut-slick, and walking towards the lot entrance, navigation becomes even tougher on the banked curves, sliding us inward to the bottom of the curve. This will be a very slow process, especially on the curves, but we find a small set of two tracks, about 4� wide and about 2� apart, with foot tracks aside them, as though someone had pulled a sled up before the ice came. While they�re still slick, they at least prevent our sliding sideways, and we slowly wander down between these and the flat surface, eventually passing the 8-mile marker, and soon after seeing some bare spots. Coleen's very slow coming down, and it's a continuous process of walking 100 yards or so, waiting, and then repeating the process ad infinitum. I slip and fall a total of 3 times (Coleen once more), but neither of us are hurt by it, and we contine to plod and slide down towards our goal. 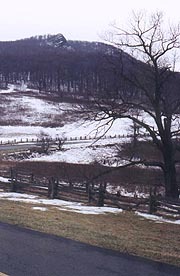 The few bare spots are short-lived, and usually surrounded by even slicker ice; but just as I�m beginning to doubt if we�ll ever make it we round a curve to see the Humpback Rocks Parking area, with totally clear road and grass in front of it. It�s cause for rejoicing, but still a long way off, though finally we�re back on bare pavement, which almost makes me jump with joy (I can�t help but think of "Waterworld", and the quest for �dry land�). It lasts about � mile before we return to a particularly tricky slope, but at least there are some vehicular tracks here � very slick, but with high enough walls that we can slide down them and not go off the side. It�s tough work � far harder than walking, and I try to think of ways to make a sled-substitute to zoom down it. It's noon when we finally come on the barricade across the parkway where it intersects VA 610, a gravel / paved road which has been cleared and appears to have recent traffic. Sometimes discretion is indeed the better part of valor; and I'm still left with the impression that had we tried to continue southbound, we'd still be out there sliding around. Besides, we made a small dent in the unfinished VA section, and should we carve out enough time off, we might be able to complete the remaining 211 miles in two sections. In any case, we're back to civilization without injury, and a few weeks later Coleen was having the first of two very successful operations done on her knees. As the snow melts and her pain is alleviated, we look forward to our return to trail life, and the final race to Kathadin.